There are 2 ways to effectively improve health and fitness, which are: to be more active and to eat healthy foods. However, many small lifestyle adjustments are needed to really make a permanent change. Here is our list of the most important changes that you can make. We have divided the 50 tips into Lifestyle Changes, Healthy Foods Choices, Rules For Getting Fit and the Root Causes of Weight Gain. Walking is an excellent form of exercise and over a set distance you burn just as many calories as jogging. Try to walk for at least 1 hour every day. This can be split up, say four 15 minutes walks per day. Read our walking guide. Shopping on foot can burn a lot of calories. If you spend Saturday afternoon wandering around the shops you may cover several miles in total and you may walk for almost an hour when you go shopping. Plus the work effort involved in carry bags of shopping will increase the energy you burn. Shop ’til you drop (weight)! Whether it is sweating down the gym, walking to and from work or a weekly five-a-side tournament, experts agree that physical activity increases your energy and stamina. Make an effort to exercise at least 3 times a week, but ideally exercise every single day. Increasing the amount of exercise you do does not mean joining a gym, you can walk more everyday, go running, cycling, swimming or play more sports. When it comes to exercising, you should ensure that you put all your energy into it. Research has shown that short periods of highly intensive exercise are just as effective, if not more so, than long periods of slow exercise. Look at our fitness section. 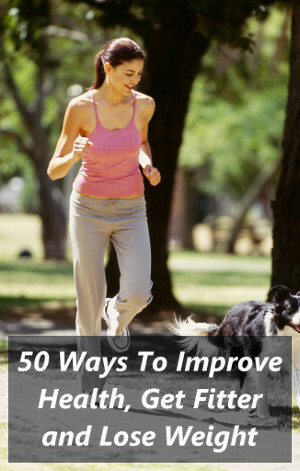 Jogging and running is still a great way to exercise and lose weight. The best thing about jogging is that you need no equipment, just an open space in which to run. The advantage of jogging or running over walking is simply that the exercise is completed quicker. Weight training is very effective in helping you to lose weight. Muscle requires a lot of energy to be maintained, so by building more muscle, you raise your metabolism and burn more fat, even when you are watching television or sleeping! Read our Beginners Weight Training guide. If you do not want to lift weights, then using a cross trainer / elliptical trainer and increasing the resistance is a great way to work your muscles harder. One classic mistake that many people make is trying to lose stomach fat by exercising just the stomach. This is termed spot reduction, and spot reduction of fat is impossible. Full body workouts are required. Tending to plants in the garden burns a lot of calories, and growing your own fruit and vegetables is a great way to get organic food. Digging over the earth, sowing seeds and weeding all burn up lots of energy. If you do not have a garden then seek some healthy outdoor activities in your area. Make an effort to get back to nature for a few hours at the weekend. You could even join a boot camp fitness class! Rest is essential and many people do not get enough sleep. When you are tired you are far more likely to snack on sugary foods. Also research has shown that not getting enough sleep can affect the way the body stores fat. When you are in bed sleeping you are not eating from boredom! Make sure you follow consistent sleep patterns – go to bed and wake up at similar times each day to get your body into a routine. Getting more sleep has other health benefits too, such as increasing weight loss and reducing heart disease risk. Also, if you are exercising then good quality sleep is vital to speed up tissue repair and growth – more sleep helps to make you fitter and stronger. Read our article on The Relationship Between Sleep, Health and Body Weight. When you are bombarded with stressful situations it is hard not to let it get on top of you. Make sure you can manage your stress and take some time out for yourself, so it doesn’t affect your health. High stress levels sap your energy sources by affecting your sleep and weakening your immune system. The less energy you devote to stress, the more you will have for the things you enjoy. Read our guide to Stress, Your Health and Your Weight. Many people try fad diet plans to lose weight. These invariably fail in the long term and the short term weight loss is often little more than a reduction in the amount of water that your muscles are storing and a reduction in total muscle mass. The main problem with diets that just involve restricting calories is that your body goes into a starvation mode, whereby your metabolism slows down (when losing weight you want it to speed up) and rather than burning fat your body uses up muscle tissue instead. As soon as the fad diet is finished and you revert to your previous lifestyle, all the weight comes back. Often any fat that is lost accumulates very quickly. The body overcompensates for what was lost and the end result is often weight gain. Learn more by reading Dangerous Diets, or read our healthy eating guide. Learning the cook healthy meals is a vital part of health and fitness. A reliance on processed foods, ready meals and snacks is one of the main reasons why so many people are out of shape today. By eating fat burning foods, not only do you improve your chances of burning fat, but you also fuel your body to help build more muscle. So, if you are serious about losing weight then ensure that you are eating some of these fat burning foods every day. Healthy, lean protein is vital to athleticism and fitness, learn more. Fish is a very healthy source of protein. Salmon is great for our brains and contains essential fats. Diets high in Omega 3 fatty acids have been shown to improve weight loss. Also, liptin that is present in fish alters your metabolism to increase the chance of using stored fat for fuel. Ideally you should eat salmon or trout 3 or 4 times a week. Seafood and fish are great protein sources. Sardines contain an amino acid called tyrosine which promotes the manufacture of norepinephrine and dopamine. These stimulants act on your brain to improve your mental focus and performance. Other lean protein foods containing tyrosine include lean beef, chicken, turkey, pork tenderloin and shellfish. One hundred grams of sardines in tomato sauce provide 177 calories, no carbohydrate, 17.8g protein and 11g fat. Soup is a fantastic way to lose weight, and the winter months make it more appealing too. A study published in the Journal of Human Nutrition and Deitetics showed that on average men that ate soup 5 days or more a week had a body mass index of 23. This is an ideal bodyweight for a lean man with average build. Beans are great, especially kidney beans. So chili-con-carne with a large serving of kidney beans makes a good weight loss meal. Kidney beans can stop carbs from breaking down into sugar, which slows digestion. This in turn prevents carbs from converting to fat. Yogurt helps to increase lipolysis (fat burning), but you need to eat at least 3 servings a day to see results. In a study carried out by the University of Tennessee, men that ate a fat free yogurt diet lost 81% more stomach fat than the non-yogurt eaters. The high calcium and protein properties make it a great weight loss aid. Yogurt is also rich in magnesium, which activates enzymes in the body to metabolize protein and carbohydrates. Magnesium is vital to energy release as it transfers the key phosphate molecule to adenosine triphosphate, the explosive energy source you use when lifting weights. One hundred grams of low-fat yogurt contains 56 calories, 5.1 g protein, 7.5 g carbohydrate and 0.5 g fat. A word of caution though; Can Greek-Style Yogurt Aid Weight Loss? Whey protein is one of the most popular supplements for bodybuilders. In fact, it helps to strip away fat as well as build muscle. The University of Toronto found that men that drank two whey protein shakes a day would eat on average 200 calories less than other men. Also the men on the whey protein diet increased muscle mass by 8% and lost 3% more fat than the non-wheyers. Consider following a Whey Protein and Amino Acid Diet Plan. If you are not building muscle then full fat milk may contain too much energy. Replacing a full fat latte with a skinny latte will save you a lot of calories and likewise having a low fat milk with your breakfast cereal will also help. The hotter the chili the greater the fat burning potential. Chilies contain capsaicin, which not only protects against prostate cancer and maintains a healthy heart, but also increases metabolism so much that it strips fat off. If you want super hot, go for Scotch Bonnets or Bird’s Eye chilies. Oats are low on the glycemic index as they contain a lot of fiber, which means that your body gets a steady stream of energy rather than a flash flood. They also contain energizing and stress-reducing B vitamins that help to break down carbohydrates into usable energy. Other low-glycemic carbohydrates include whole-grain bread, brown rice and high-fiber cereal containing bran. One hundred grams of oatmeal provides 385 calories, 68g carbohydrate, 11.8g protein and 7.3g fat. Buy our Low Gi eBook. Breakfast cereals such as Weetabix, Shreddies, oats and muesli all help to keep weight down. A study by the National Weight Control Registry found that people that lost weight and kept the weight off were more likely to eat breakfast cereals rather than any other breakfast. Cereals release energy slowly, meaning that you are less likely to snack on junk foods before lunch. Add a generous helping of milk to feel fuller longer. A favorite of bodybuilders and athletes. 200g of cottage cheese contains as much protein as a small steak, and it also contains casein. This means that cottage cheese is a slow digesting food, meaning that you are less likely to overeat later in the day if you eat cottage cheese for lunch. It also makes a great snack if you have an intense training schedule. Finally some fruit! The 5 a day rule is healthy, but does not generally help us to keep the fat off. Ideally you should eat one and a half grapefruits a day, split into 3 snacks. Grapefruits are high in vitamin C, which actually dilutes fat, making it easier the flush fat from your system. Researchers at Louisiana State University found that people who ate grapefruits regularly lost on average 4 pounds more over a 12 week period than other diets. The caffeine in coffee blocks a chemical called adenosine that otherwise interferes with energy-boosting neurotransmitters. A mug or two per day can be beneficial but any more than this may trigger withdrawal symptoms, one of which is fatigue. Remember to drink additional water as caffeine has a mild diuretic effect. Lentils are a great source of both carbohydrate and protein. They are also high in B vitamins, iron, magnesium, potassium, zinc, calcium and copper. Lentils are also low in fat and calories. If you don’t eat beans often, start with a small portion or you’ll experience the flatulence factor and end up dining alone. Some other good choices include navy beans, chickpeas and kidney beans. One hundred grams of boiled lentils provides 199 calories, 17.5g carbohydrate 7.6g protein and 0.4g fat. Read Why Vegan Athletes Keep Winning to learn more about a healthy vegan diet..
Bananas are packed with “easily digested sugars and potassium, which help to maintain normal nerve and muscle function. Potassium isn’t stored for long in the body and levels can drop during times of stress or during strenuous exercise, when it’s lost through excessive sweating. 1 medium banana contains 105 calories, 27g carbohydrate, 1g protein and 0.5g fat. The feel-good factor in chocolate comes from certain bioactive compounds such as tyramine and phenylethylamine, according to a study in the Journal Of Food Science. Chocolate has also been credited with combating anaemia, awakening the appetite, aiding digestion and improving longevity. Of course the sugar, fat and calories mean it should be consumed in moderation. Dark chocolate has the fewest calories and the most antioxidants. Half of a 50g fruit and nut chocolate bar contains 240 calories, 27g carbohydrate, 3.9g protein and 9g fat. Strict low-fat diets are often iron deficient. Iron is a component of haemoglobin and when stores are depleted, the cells in your body slowly suffocate and burn carbohydrates inefficiently. Consequently, you feel sluggish, can’t concentrate and are exhausted after minimal effort. Red meat delivers the most accessible form of iron, so a high-quality steak once-a-week will ensure that iron levels stay healthy. One hundred grams of top sirloin steak provides 229 calories, no carbohydrates, 29g protein and 11.5g fat. Lean meat is a recommended protein source. Not all fats are created equal. While almonds are high in fat, it is the monosaturated variety which provides high-powered fatty acids known as omega-3s and omega-6s. These promote an alert mental state. The saturated fats found in butter and cheese, on the other hand, make you lethargic by lowering the amount of oxygen being pumped around in your bloodstream. 12 almonds provide 83 calories, 3g carbohydrate, 3g protein and 7g fat. The classic party nut. Pistachios are high in lean protein and they also curb the effect of carbs on your blood sugar. This means that eating pistachios helps to keep your waist slim. These make an ideal snack. As well as the long term damage alcohol does to the liver it also stops you from burning fat. When you drink alcohol your body starts to metabolize it, as alcohol is a form of energy. While your body is using the alcohol all other metabolism is put on hold, so you do not burn sugar or fats for energy. So although you do not gain weight from alcohol itself (there is no way for the body to store alcohol) it causes weight gain because the body uses less sugar for energy, which is therefore stored. Alcohol also disrupts healthy hormone function, which further hampers fitness and weight loss. See British Celebs Stay Slim By Avoiding Alcohol. Most people grab a sandwich when they are feeling a bit hungry. Many have toast for breakfast. Add a pizza in the evening and all this bread contains a huge amount of calories. It also has mostly “empty calories”, meaning that the energy is not combined with nutrients and vitamins. Give up bread for a week and you will see a difference. Mild dehydration can affect your mental and physical performance. A loss of just one per cent of your body’s water stores can cause you to feel sluggish. Make sure you drink at least eight to ten glasses of water a day and more during hot weather and when exercising. Water makes it possible for your body to digest, absorb and transport nutrients. It also helps to regulate body temperature. When you’re dehydrated, your cells receive nutrients for energy less efficiently, and your body can’t properly expend heat through sweating. Both conditions lead to fatigue. Aim to drink eight to ten glasses of water every day and more when exercising. It is important to remember that alcohol and caffeine both act as diuretics, which mean that if you drink these then you will urinate more and become more dehydrated. Water really is the best drink you can have for your health. Fitness is all about good planning. And never give up! If you do not believe in yourself you will not be able to achieve your desired results. There will be days when you feel close to giving up, but be determined to fight back. You can do it. If you are like most other people, a key reason for wanting to change is to look better. Place a picture of how you currently look somewhere that you will be able to see on a daily basis. This picture should provide you with additional motivation to follow this program. Or post a photo to your training log, so that others can see your progress, and give advice and encouragement. How can you get somewhere if you don’t know where you are heading? Share your fitness goals with others, that way people can provide you with greater support. New Year is a good time to readdress what your goals are. Resolve to get fit and healthy. This should include a list of things you wish to achieve (your goals) and ideally something about how you will work towards your goals. Remember those resolutions you made? Maybe by the summer you may have forgotten why you are exercising every day! Write down the reasons why you are following your fitness program and put them on your Facebook page so that everyone can see them – and hopefully remind you too. After each month, compare your results against what you had in your original goals. Be critical of your own progress, but also be realistic. You will not always fulfil your goals, but it is better to aim high, and work hard, than to give yourself a task that is too easy. Challenge yourself. Place a calendar on your fridge. Mark a back slash on the days that you followed your diet without cheating. Make a forward slash on the days that you trained. If you trained and followed a good diet on a given day, you should have an X marked on that day. Remember, long-term fitness and health comes one day at a time. Take pictures of yourself every month and place them next to the before picture. This is to keep reminding yourself why you are doing this and also get motivated by seeing the progress that you are achieving. Remember to prepare all your meals the day before, so that when you are at work, you already have all of the food that you will need for the day with you. That way you limit the amount of times you’ll be tempted. Being prepared really is one of the most important factors in successful weight loss. Without a plan all good intentions end in chaos. Keep your house free from any foods that are not good for your program. Only on Sundays can you bring these foods in the house. Hide your junk food away where you cannot see it – sometimes the simplest solutions are the most effective. Remember that only you control what goes in your mouth and how active you are. Food does not control you and your feet do not control you. You think, therefore you are. Think yourself fit – eat healthy, exercise often. In the technical or business world whenever a serious problem arises analysts work hard to determine the root cause of the problem, so that it can not only be put right, but also it does not happen again. So we at MotleyHealth.com have taken this same approach to the obesity and weight gain problem. The serious problem is weight gain, so what is the root cause? The seemingly logical answer is that people are putting on more weight than ever before because of lack of exercise and poor diet. This is only partially true though. If these were the only problems, why do so many people fail to lose weight? The real reason why people fail to lose weight is because of the lack of will power. You may want to lose weight, but unfortunately your mind has other ideas, as it continues to wanting to eat more food just in case of a future disaster. So, how do you learn to overcome your natural desire to eat too much food? Just follow our rules based on the root cause analysis of weight gain. It is important that you learn to eat whenever you are hungry. This is counter-intuitive, but one of the main reasons you put on weight is because you binge on sugar-laden foods when you get hungry. The way to avoid this situation happening is to not allow yourself to get so hungry that you act irrationally. Of course, this does not mean that you can eat all the time. The trick is to not starve yourself while at the same time not overeating. It is a careful balancing act, balancing your nutritional needs and your mental desires. If you consume small, planned meals throughout the day as part of a nutrition program, while also doing plenty of exercise, you can avoid getting hungry and therefore avoid binge eating. If you do not think that this is possible, watch how a child eats. Children only eat when they need to eat, and then will only eat enough to fill them. You cannot even force a child to eat food that they do not want, but as an adult you eat food that you do not need. Be like a child, eat when hungry, but only what you need. Emotional eating comes in many forms, but it is most common when you are feeling depressed or suffering from anxiety. Although some people stop eating when stressed, many others will combat their emotional turmoil with food. It is when you are stressed that you become weak and your natural desires start to take over. How many times have you grabbed a packet of biscuits and convinced yourself that “only 1 biscuit won’t hurt” and then go on to eat half the packet? These events almost always occur when you have just had a stressful experience, either a bad day at work or an argument with a partner. Somehow our subconscious knows we are in a weakened state and tricks the conscious mind into having “just one” biscuit. Why? Well, the brain feeds on sugar and that is the real reason why we crave sugar. So, how can you overcome this? The easiest way is to plan your kitchen better and also put up notices. For instance, place all the bad foods (check the glycemic index for information on what is bad, bearing in mind high sugar content is the biggest problem) into a separate cupboard. Put all your cookies and chips away in a tin and write a label on top of the tin that says “Come back again in 10 minutes if you really want one”. A child will not bother reading the note, but it could well save you from binge eating. Another way to help prevent any form of binge eating is to ensure that there are healthy grabs and good foods available. So, always have fresh fruits and salad items that you can eat instead if you really feel the need to snack. Instead of grabbing cookies, toast and ice-cream when upset grab the carrots and humus dip or chopped pineapple and banana. This is a somewhat controversial approach to weight loss, but it can be very effective. The idea is simply that people that are of a naturally healthy weight do not deprive themselves of treats. The reason why they do not put on weight is because they never overindulge. It is OK to have some cookies, chocolate cake, ice-cream, beer or even white bread every now and then. You give yourself these as treats though. Do not fall into the trap of having whole days where you treat yourself, or even 2 days in a row of small treats. Limit yourself to once a week at most where you can have your favorite treats, such as a piece of chocolate brownie with your meal on Saturday night or a bacon sandwich on Friday morning. The trick is to learn when a treat becomes an obsession. Some children are given “occasional treats” by adults, but adults who lack self discipline often treat themselves several times a day! Am I really hungry or do I want to change how I feel? So often people eat because it is the time to do so. It is “lunchtime”, “dinner time”, “supper” or because friends and family are also eating. A very common reason people give for eating when not hungry is simply because they just felt that they should eat something. Not because they need to eat, but because it is a designated feeding time. We are not animals in the zoo, we should not have to follow strict feeding times. Thinking about what you are eating will help you to control your food intake. Overweight people are thinking about food all the time, except when they are eating. While eating the mind goes blank, almost into a trance, until all the food is gone. Why is this? When you eat, a hormone called serotonin is released making you feel happy and wanting to carry on eating. The effect this has is that when you eat quickly you ignore the signal from your body to stop eating when you have eaten enough which results in overeating and then bloating. By thinking about your food as you eat, you naturally slow down, chew more and feel full at the right time. One trick is to put your knife and fork down while you are chewing, or if eating a sandwich, put it down too. Look at your food as you eat it, think about the food, its texture and the way it makes you feel. Savor it. And chew your food up to 20 times before swallowing it. It is important not to eat while watching television, reading, drinking or working, as these all distract you from the food. The purpose of this is to teach yourself to eat slower all the time. The longer you practice this method of eating the easier it will become and in time you will naturally eat less because you will want less. So often people feel the need to finish their dinner. As children we are conditioned by our parents to “eat it all up”. Parents are often so concerned about children not eating enough that they end up encouraging their children to eat too much. Adults are literally programming their children to eat more than they need, to eat more than they want, and to eat faster and ignore their own natural body signals to stop eating. To reverse this you must learn that it is OK to leave some food on your plate. If you have a sandwich, or pizza or bowl of pasta then you should not feel that you have to finish it. Food actually keeps in the fridge much better than most people think. If you cannot finish it today, eat it tomorrow. Save money and lose weight! This is a fun experiment that you can try. In a study a few years ago researchers found that when people we blindfolded they ate about 25% less than normal. Why? Because by not being able to see how much food they had eaten, or how much food was left on the plate, their only indication as to how much food they had had was by how they felt. More often than not, people felt full enough to stop eating long before finishing the food on their plate. By being blind folded you are also more aware of the taste and texture of the food. Some people actually found that they disliked their usual daily meal when blindfolded. A classic example is the full cooked breakfast. In the study when subjects were sat down with their usual sausages, bacon, fried eggs, baked beans, hash browns, toast and ketchup, but then blindfolded, many found that the food was too salty and stodgy for their taste. Even though they had been eating this very meal every day for years. Quite simply we have learned to ignore our natural body signals that tell us if we need food, or even like food, or not. By being blindfolded we can learn to start listening to our body response to food again and not just going with the flow out of habit. To lose weight you must learn to break old habits. Often people are so serious about losing weight that if they miss a workout or allow their diet to lapse they punish themselves emotionally. If you slip up you have not failed. Learn to forgive yourself and move on, carry on with the plan. If there is one magic weight loss elixir, then it is water. Water is really the only liquid you should drink in large amounts on any day. Black coffee is good for a caffeine boost to help increase your workout performance. Water should be drunk the rest of the time. Fruit juices are high in sugar and your body does not react differently to sugar from fruit juice to that of sugar from candy. Sugar is processed and turned to fat if it is not used as energy. So do not drink those healthy fruit juices, as you should be getting enough vitamins and nutrients from your healthy diet. All juice just adds to more sugar. Also, many people mistake thirst with hunger. So, next time you start to feel a little hungry in between meals, have a glass of water before your start to think about getting a healthy snack to eat. So the secret weight loss weapon is water. If you are doing all the right things to lose weight, if you are exercising properly, eating healthily and not cheating yourself, then weight loss will come eventually. The worse thing you can do is to keep weighing yourself. Whenever someone weighs themself and finds that they have lost less weight than planned they start to doubt their methods and themselves. All regular weighing can do is reinforce the idea that you are not doing things right. If you are losing weight then your progress should be obvious anyway, you will have more energy, your clothes will be looser, you will be fitter and feel stronger. If you have to weigh yourself make it a monthly event, not a daily nor even a weekly chore. Many people fail to get in shape or lose weight because they simply do not exercise enough. To get fit you need to exercise often, and a little exercise every day is possibly the best way to stay fit. Also research revealed that exercising for one hour every day is the best way to lose weight. Many people adopt diet plans which allow weekends off or “cheat days”. Really it is better to make your diet healthier 7 days a week, with the rare treat (birthdays, Chrismas etc.). Eating the same things all the time can become monotonous and lead to snacking and comfort eating. If you ensure that your daily diet consists of many of the foods mentioned above then you will experience greater energy levels throughout the day, and also have more energy for exercise. However, please ensure that if you do enjoy a lot of these foods, that you do some exercise, otherwise this extra energy will turn to fat. Sounds rather clichéd, but enjoy living. You only have one life, make the most of it. Do not spend your whole life in front of the television! These rules are very simple to follow. Stick with them and make them your own. Make them part of you daily routine, and you will soon find that you have higher energy levels. More energy means that you can do more of the things you love and you should also feel more motivated to exercise. A few positive lifestyle changes can quickly have a very beneficial knock on effect, leading to many more health gains, both physical and mental. To conclude, the best way to lose weight really is to combine all of these points, make a full and permanent lifestyle change, and never give up. Life is precious, and if you want to live as long as possible in good health losing weight is essential. This is not a list of things to do in isolation to lose weight and get fit, it is 10 things you can do to enhance your current weight loss plan. Losing weight really is a matter of eating less than your body needs. Every minute spent sitting in a chair watching television is a wasted minute if you want to lose weight! These small changes will help you to burn a few extra calories. Do these, plus some more, and you will become a more active person and weight management will start to feel more natural to you. Eat a healthy diet, do regular exercise and learn to relax and get a good night sleep. If you follow these rules, not only will you successfully lose weight, you will live a fuller, happier life. Although you do not need a system to lose weight, many people do respond very well to a structure weight loss system. By following our guide to losing weight you can more easily stay on track and fulfil your goals. The weight loss systems provide more information on nutrition, feeding your muscles while burning fat, and various different exercising methods to help lose weight. Adenosine is not energy, it is a chemical which plays a role in ATP. Adenosine binds to adenosine receptors when ATP levels are running low. This prompts us to feel tired and sleep to recover lost energy. Caffeine binds to some of the same receptors as adenosine, however, rather than making us sleepy it creates adrenaline which increases heart rate, breathing and prompts the muscles into action. The overall result is that rather than resting, people are still hyper. Energy levels fall. While caffeine does indeed boost exercise intensity in the short term, you could actually be reducing your energy levels if you have large amounts of coffee every day, as you are not giving your body what it really needs when energy is low – rest. Also, those who drink a lot of coffee build more adenosine receptors, which is fine while you are jacked up on caffeine, but the moment the caffeine goes you have more adenosine binding, and you feel even more tired than normal – and this affects exercise intensity too. If you are only having a few cups a day then it is not going to be a problem. Like all things, safe in moderation and don’t drink too much coffee. I have drank for years. I’m 46 and have a gut. I usually can lose my lower gut, but the top really never goes away. Currently I jog 2 miles in the AM 7days a week. How many meals should I strive to eat a day? Any suggestion? I Shaun, 3 meals a day works well for most people, so long as each meal is modest and healthy. No snacks inbetween either. Fantastic site you have here but I was curious about if you knew of any ommunity forums that cover the sane topics discussed here? from other knowledgeable peopole that share the same interest. There are many Maxwell. I am pretty sure the largest is Bodybuilding.com, but there are many others.